It was a breezy, unexpected commute for riders on board a New York-bound NJ Transit bus that was on the move with an open front door, according to a commuter. A Twitter user posted a video on social media with the caption “Lovely ride with @NJTRANSIT #NJTransit” on Thursday in which the front door of a bus is seen almost wide open while traveling. 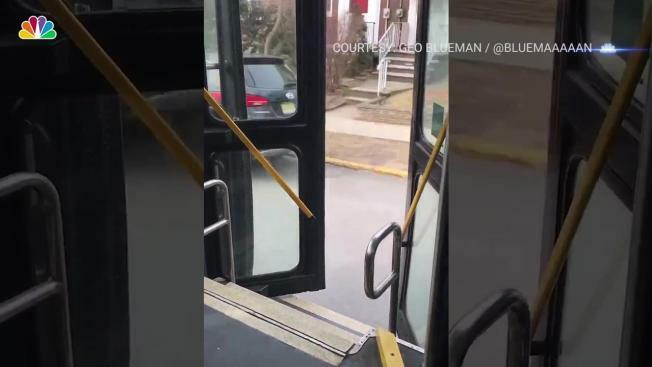 The Twitter user and bus rider, Geoffrey Blueman, says the video was taken about two weeks ago on Feb. 27 around 8 a.m. and shows a Route 159 bus from Cliffside Park to New York City. The video captures the open front door of the moving bus making its way through was appears to be a residential street. NJ Transit contacted Blueman via Twitter shortly after the video was posted to say the issue "has already been reported to the garage." Blueman told NBC 4 New York that the bus was packed with all seats filled and people standing. According to Blueman, "the door would alternately close fully or stay jammed open after each stop." Blueman says he frequently rides the bus but he hasn't encountered the door being jammed open before this incident. "We are thoroughly looking into this matter," NJ Transit spokesman Jim Smith said in a statement. "A bus should not be operating with the doors partly open at any time. We encourage the customer who recorded the video to contact us as any additional information such as a bus number will assist in our investigation."